Barcelona’s Sónar festival needs little introduction. Now in its 21st year, it has become a world-famous celebration of cutting-edge music and new media art where renowned artists join young pioneers. Did the Sónar founders think they would reach such heights when they first began? Possibly not, but such is the case, and alongside the rise of Sónar, another phenomenon has had equal success: Off Sónar. The Off Sónar events taking place around Barcelona attract huge numbers and feature many of the world’s best DJs. There is no formal connection between Sónar and Off Sónar; indeed, the former offered no comment when Miniguide asked for their thoughts on the matter. But there is no doubt that both feed into Barcelona’s reputation as a haven of creativity, imagination and – let’s not forget – having fun. And what’s not to like about spending a few days in June in Barcelona? The city offers beautiful weather and beaches, stunning architecture, interesting corners and surprises, and a mixture of people, residents and visitors. No doubt many will be attending both Sónar and Off Sónar events, and a lack of choice is not a problem. We’ve handpicked five Off Sónar parties, from label showcases to mini-festivals which look particularly inviting and that offer high-quality electronic music. We’ve also spoken to the organizers to get a sense of the ethos behind their events. Buying advance tickets is highly recommended. Let’s start with Resident Advisor, one of the most influential dance music websites. 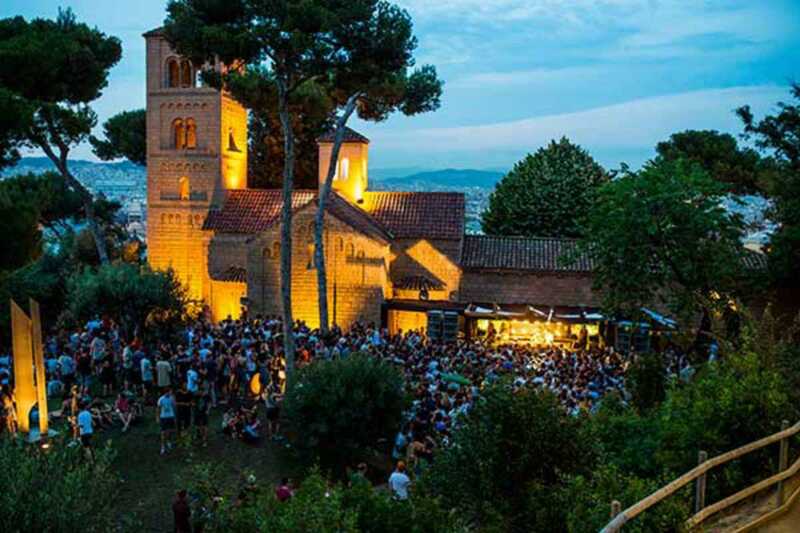 They’ve once again joined forces with Barcelona promotors Indigo Raw for an afternoon and evening party on Thursday, June 18th at the beautiful El Monasterio in Poble Espanyol. As well as offering spectacular views of the city, music diversity is central. “We wanted to have a varied nine hours,” explains Kristen McElwain from Resident Advisor. “Our readership enjoys a wide variety of music, and we like to push that envelope as opposed to genre-specific parties.” Step up Andy Stott playing live, Erol Alkan, Jackmaster back-to-back with Gerd Janson, Pearson Sound and more, all of whom have enjoyed wide support on Resident Advisor. In fact, Stott’s Faith in Strangers was the staff album of the year in 2014. Promoters B4 and Undrez will be having a very busy Off Sónar with six nights of Techno Off Week at Bloc near Plaça Catalunya and five nights of house and techno at A86 in Poblenou. They’re also hosting five intimate parties entitled R33 at the new Dome Club (formerly La Boîte) on La Rambla. Hot Since 82 presents Knee Deep (June 17th), Nicole Moudaber with In The Mood (June 18th), a Cadenza Showcase (June 19th), Hector presents Vatos Locos (June 20th) and Paul Ritch’s Quartz Rec (June 21st). Fran Balsa from B4 describes the philosophy behind R33 as “up close with the music” with the intimate nature of the venue creating a space where the DJ and crowd can truly interact. The Knee Deep party, in particular, should be a great way to get the week started. If you’re looking for something close to the beach, Fuse at the ZT Hotel in Vila Olímpica on Saturday, June 20st is a good option. Running from 2pm to 11pm, it will bring the vibe of one of London’s most popular parties to Barcelona, and Fuse also host parties at Space in Ibiza. Joining resident DJ Enzo Siragusa will be Livio & Roby, Nastia and friends. When it comes to venues, Moog in Raval is one of the originals in Barcelona with a reputation for supporting underground music. Their program reflects this with the highlight being PullProxy presenting Proxy 4.0 on Thursday, June 18st. PullProxy are a booking agency and promotions company from Berlin who champion underground music and their party is definitely one for true techno aficionados with an international lineup of Developer, Subjected, Agaric and Adriana Lopez playing dedicated label sets. Joining them will be Spain’s Ángel Molina. We’ll finish with these words from Carola Stoiber at PullProxy: “Techno was created to unite and it became a worldwide community before the Internet, mobile phones and Facebook. Some DJs are older, some are younger, but that’s not important. What’s important is quality music from unique DJs in quality clubs.” Enjoy!